Complete eyewear consists of lenses and a frame or mounting. A frame starts in the middle with the bridge that straddles and supports the mounting on your nose. Next the eyewire attaches your lenses to the mounting. The bridge and eyewire are collectively known as the front. An endpiece is secured to the eyewire from which the temples extend back over the tops of your ears to distribute the weight of your glasses and to afford some retention to keep your eyewear from sliding forward. Barring physical sensitivities, such as metal allergies, and armed with the knowledge that there are no rules, your first consideration is a plastic or metal frame. This is basically a style issue. Metal mountings tend to be less dramatic on the face and blend into your look more subtly. Plastic frames tend to make a more dramatic statement about your personal style contributing more significantly to your image. Within each of these broad categories there are many options. No one manufacturer utilizes the same materials across the spectrum of their brandname. Our friendly, knowledgeable Opticians stand prepared to explain the features and benefits of each of your options. typically are secured by tightly strung nylon monofilament that fits into a groove that runs around the perimeter of the lens. This presentation is reasonably durable, lighter in weight and more subtle on the face. The full rimless design uses the lenses to define the eyewear. A single bridge piece is attached to the nasal portion of the lens using screws or a variety of proprietary methods. On the temporal portion an endpiece is attached in a similar manner from which the temple extends. Once very delicate, the introduction of polycarbonate and Trivex® lens materials have made these lightweight, virtually invisible designs increasing popular. 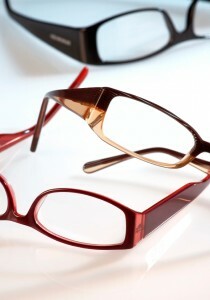 Most eyeglass frames have temples. These are the arms that extend from the front of your frame back to the tops of the ears. Generally, they continue downward and can be adjusted comfortably into the space between your skull and your ears to secure your eyeglasses. They form the base of a triangle whose apex is the bridge of your nose, upon which your new eyewear will rest. The temples typically attach to the front with a hinge. Standard hinges open and close at your mechanical prompting. More commonly many frames now employ springs. These apply subtle tension to the side of your head, helping to hold your eyewear in position, while simultaneously absorbing the pressure of the temple spreading outward as you remove your spectacles, maintaining your eyeglass’s adjustment. The latest innovation eliminates the hinge. Usually employed on full rimless designs, the bridge and the temples are made from a thin, flexible metal. The arms apply gentle pressure to the side of your head securing your eyewear. These designs are extremely light but are only indicated for individuals who wear glasses throughout the day. Putting these models on or taking them off requires two hands and can be a tad cumbersome, and they are more delicate than a full frame. Ask our Opticians for assistance in this choice. The frame is supported on the nose. Pressure here maintains the position of the lens in front of the eye assuring good vision and comfortable eyeglass wear. Generally, with plastic frames the bridge straddles the sides, sometimes saddling over the top of the nose. In metal frames a guard arm extends out from the eyewire to which a pad is attached. Theses pads can be made from a hard plastic, but more recently a soft silicone is employed to lessen the pressure. Parrelli Optical® Opticians are skilled at positioning these pads to maximize your comfort. The certified professional Opticians at Parrelli Optical® have the skills to design the perfect eyewear for you.